Back office system including user/produc/conten management with AAA & CP/SP API function. According to business needs, establish a unified user information view, and maintain user information and its lifecycle, including: user information management, user group management, user subscription management, user group subscription management, etc. User information management: Manage user basic information, and maintain the user life cycle. User group management: Unified manage the users under the current user group, can make the user easy to operate. User subscription management: Manage the products that the users ordered, and maintain the subscription life cycle. User group subscription management: Manage the products that the users ordered, can make the user easy to operate. Including product information management, product pricing strategy management, product type management. Product information management: Manage the basic information of product, maintain the life cycle of the product. Product pricing strategy management: Manage product pricing strategies to provide reliable pricing information for product information. Product type management: Manage the basic information of the product and provide the product type data for product information. 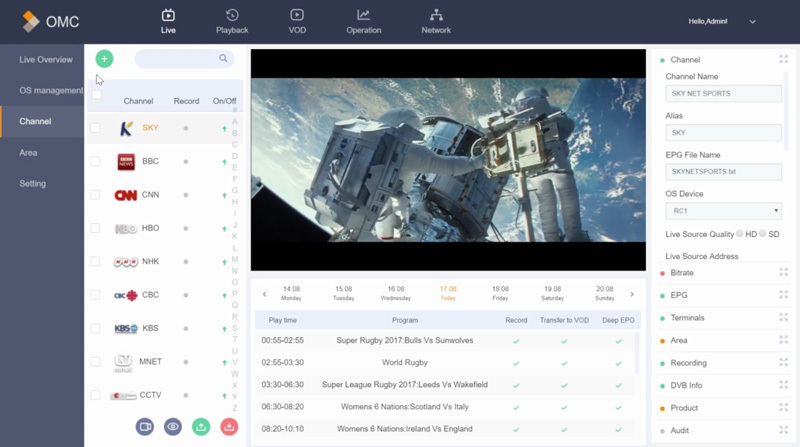 Contents include VOD data, live data; can realize the life-cycle management of self-owned content and external introduction of content, like injection, editing, packaging, reviewing, and publishing. Column classification of life cycle management, electronic program management, basic information management and so on. At the same time can achieve the operation and management to the content, can cast content based on different types like the column, the regional, the user group, the resolution, etc., to meet user operational needs. Mainly including user authentication and business authentication, refers to the user identity information and authority to determine whether the user has the right to use a business. User authentication: follow up user name and password and other information to verify whether the user is legal or illegal, to ensure the rights of users, and provide users with security guarantees. Business Authentication: follow up the products the user bought, to determine whether have the rights to watch or use the charged product, can ensure the user viewing rights. The introduction and management functions of third-party CP / SP, to provide users with a richer third-party content and services, such as the introduction of licensees, internet video, games and so on. While providing audit, release and other management, to verify the legality of third-party business.